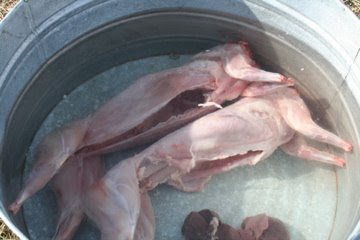 So about two weeks ago Matt and I butchered several rabbits and we have been really busy here lately that I haven't allotted an of my down time to blogging. Tonight I decided was long enough to wait, so here are some pictures and a little but of the procedure. Any questions?... Feel free to ask. After we wean bunnies from their mother (6 weeks), we allow them to reach 4-5 lbs (12 weeks) before making the decision to butcher or keep for breeding stock. To eliminate breeding full brothers and sisters, we only keep either bucks or does from a working doe. We don't always keep every buck or every doe from a litter. Only if they're awesome like doe #14 and buck #4 (who multiply like... rabbits?) do we keep all does. We seldom keep all bucks from a litter. If they aren't kept, they're butchered. The hunt is simple... put bunny into crate from hutch. Its best to carry them like a mother cat carries her kittens, by grabbing a handful of skin on the back of their neck. Be careful of their kicking feet and sharp claws. My war wounds (scratches and one bite) just healed up. Two bunnies ready to be butchered. Once your are prepared to butcher... burnt peace offering, say prayer, deep breath, or whatever it takes for you to be mentally ready to kill such an awesome creature (I usually just jump right in), grab to fryer (terminology helps desensitize the act) in your non-dominate hand by grasping right in front of the hind legs. This is different than the description of carrying mentioned above (see picture below). In your dominate hand grab a heavy stick or metal pipe about 18 inches long. Give to fryer a good blow to the back of the head, right above the ears. This will instantly knock-out the fryer and allow you to hang it up by both feet and slit it's carotid arteries. The fryer will then bleed out and basically die in its sleep. In my opinion the most humane way to kill. Here I am right before "The Kill." Notice the holding technique. Here the fryer bleeds out. We catch the blood in a bucket. Once you get them hung up and bleed out, it's time to skin 'em. 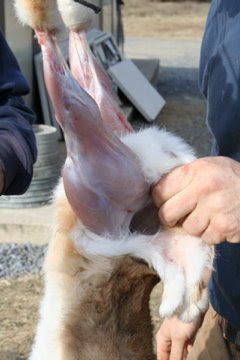 We start with the hind legs and pull the skin down over their bodies like a shirt over their head. Once we cut the front feet off, the head comes next. We try to cut the head off at the same cut used to bleed them out. Matt and I skinning fryers. Rope and a clothes line post is all you need to hang them. Notice how the skin is in one piece. Just like a shirt over its head. I'm pulling out the front feet to cut them off. Here Matt cuts off the head. Notice how he holds the ears and pulls down. This allows him to cut against something firm, not limp and dangerous. One you have the skin off, its time to eviscerate. If you have ever butchered a deer, the process is exactly the same... only scaled way down. Be careful not to get any urine or manure on the carcass. If you do just wash it off... no big deal to me, but for customers you need to keep them as clean as possible. We keep the liver to sell with the carcass. The only difficult task is removing the gall bladder. Its hard to get a hold of, but unlike a chicken, it won't bust easily. I tried to bust one and its rather strong. Make sure to go past the diaphragm and remove the heart and lungs. Starting the cut into the cavity. Use your fingers to protect the guts from puncture and cut up. The inside of a healthy fryer can be a awesome sight. Pinching the gall bladder off. Don't worry about busting it... just grip and pull. Once we have eviscerated, we cut off their hind feet. wash the carcass with cool water, and then place them in a tank of cool water while we butcher the others. This allows for quick cooling and hydration. It also keeps the flies away from the meat. Once we are done butchering, we pack the carcass (with liver in body cavity) in plastic bags and freeze them. Nice hind quarters after feet have been removed. Makes you wanna slap your daddy! Here Matt washes the fryer with clean water. Cooling down in the tank. Notice the liver below the carcasses. I hope this brings you closer to understanding Polyface's butchering process. It's really simple and only requires a sharp knife and some practice. Thanks again to Rachel for all the photos. Fantastic tutorial! What kind of rabbits are you raising? Very cool. My husband is looking in to getting some meat rabbits. Do you know of any for sale around Maine, he is willing to drive a distance at this point. He really enjoyed you post too. Our rabbits are from New Zealand Whites and Californians, but now they since they have been line breed for over 15 years, we consider them a breed of their very own. Line breeding with rabbits does wonderful things. I don't know of anyone near Maine that is selling rabbits... sorry. Daniel just happened upon the one he started with. The great thing about rabbits is that they multiply like crazy. You might check around to see if there are any industrial rabbit production facilities. Their rabbits would be a good start and then he could pick and choose which to keep. 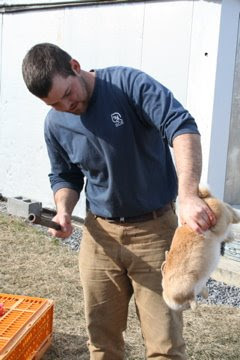 There is also the Eastern Maine Rabbit Breeders Association (http://www.emrba.org/). Good Luck!! I don't eat rabbit, but I love the simplicity and clarity of this tutorial. Makes it look so easy! Currently we are keeping most, if not all, of the does from our good working does. We're trying to build the colony up for the summer and are counting on doe bunnies working as well as their mothers. We also keep a buck every now and then that looks masculine. One in particular was kept back a couple months ago and he is awesome. I'm not sure the exact traits, but if you could see him you would feel the same. We kill the way we do because it allows the rabbits to bleed out. If their hearts stop beating then the rabbits will not bleed out properly. 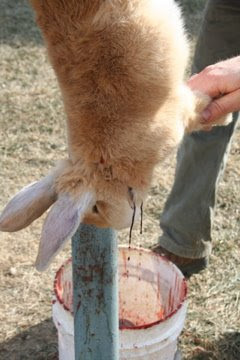 As you can see in the video you linked, once the butcher cuts off the rabbits head, they are no longer bleeding. As for Polyface's official comment... I'm not sure. But I know I wouldn't dislocate based solely on the bleed out. Thanks for the info. I wondered about the bleed out as well. I suppose the thing to do would be to try both methods and compare the volume of blood, to see if dislocation results in a less thorough bleed out. Wonderfully informative post! I have been wanting to do rabbits for a while now. Just have to work up to the capability in terms of infrastructure: time and money eh! If you insert the knife under the string that holds the gall bladder and free that, you can then pick up the entire thing by that very string and pull it off easily. I've been wanting to graze our rabbits but I'm still not understanding how we'd do it since I thought that until they were 4 to 6 months old getting "green" food would give them diarrhea and lead to death. Do you put them only on dried up pasture, or on certain plantings? In our area (Pacific NW), the grass and weeds are very green most of the year. do they sell rabbits as breeeding stock? and could they make a delivery to dc some time? are they all brown? Excellent posts. I will be returning regularly to absorb more knowledge, as I've just began on my journey of rabbit raising you can see at my blog (farmintheforest.wordpress.com). 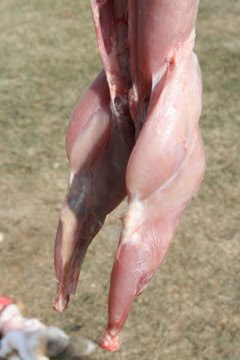 Do you slaughter all of your rabbit for market on site at the farm? 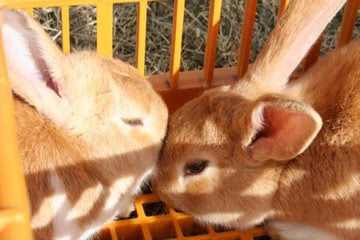 We are looking to raise rabbits and are wondering if we can do that and still sell to restaurants legally? We are thinking of raising rabbits for meat here on our California homestead. Youg blog posts on rabbits are wonderful! Thank you for all the great information. I'll be bookmarking this! Good pictures for the tutorial thanks! Poor rabits. But rabits are so tasy also.